My Place Teen Center would like to recognize and congratulate Muna for being the Teen Member Spotlight for June! 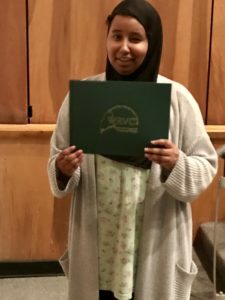 Muna is eighteen years old and currently a senior at Westbrook High School. She’s lived in Westbrook for two years and has attended MPTC since last April. MTPC staff commends her self-determination and forthright personality. Muna is a confident, determined, young woman who can achieve anything she sets her mind to. Muna says she feels most at home when at the Teen Center. She takes joy in science, technology, engineering and math programs offered at the Teen Center as well as helping out with responsibilities like cleaning the cafeteria after meals. She attends every day. We are appreciative of the leadership and courtesy she has brought to the group this past year. The words Muna used to describe herself are independent and level-headed. Muna also enjoys riding her bike, reading, and going for walks. She takes interest in reading scholarly articles and various genres of media. Her favorite song is “I’m Alright” by Kenny Laughlin and her favorite movie is Over the Hedge. She recently completed the culinary arts program at the Westbrook Vocational School and took interest in baking. Her favorite foods to cook are chocolate cake and cannoli. Keep up the amazing work, Muna. We are proud of you and all that you have accomplished thus far! Happy Graduation!